[mainbodyad]There’s no way I could tell him no. (Last week, I was working from home and he walked into study with a dish of freshly prepared Korean teriyaki beef he cooked on a whim. If he wants apple pie, he’s going to get apple pie.) He promised he’d help me to make it go faster, which was a huge blessing otherwise I’d have been up until dawn. We went to the grocery store after running some other errands and, by 9:30 p.m., were at home ready to start the process. It is now 3:11 a.m and the pies are finally cooling on the counter. They are going to taste delicious but between the constant yawning and the too-warm pie dough (we have to leave early tomorrow so we didn’t have the luxury of letting the dough cool for five or six hours before working with it), the lattice construction looks like something you might expect from a 19th century, hook-handed, drunken pirate with an undiagnosed case of the shakes. It’s not as noticeable after baking, nobody else will care, but I see it and it drives me nuts. I had planned on blogging the entire process, step-by-step, given that it’s the third time in the past five years I’ve talked about this particular dessert on the site (not to mention it’s nearly as popular with my family as the cinnamon roll recipe!). Mission postponed. We are too exhausted. I want to go curl up in our bed now. Someday, I’ll post a visual tutorial like I did with the white chicken chili recipe but, in the meantime, to make up for it, here’s what I’ll do for my fellow dessert aficionados: If you’re interested, send me a quick note through the Contact Form and I, Aaron, or someone else, will respond to you with the details on how to make the pie crust and the pie filling. 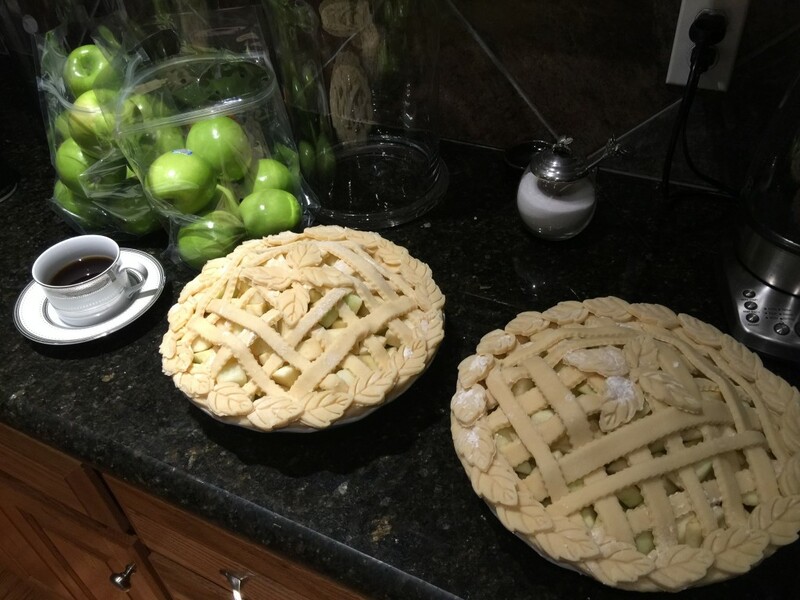 They were conscripted from two different recipes after I tested and evaluated too many pie constructions to remember, ultimately settling on this holy combination of butter, brown sugar, white sugar, and granny smith apples. It’s just a written page from my own note files, but if you know how to bake, you’ll be able to make sense of it easily. 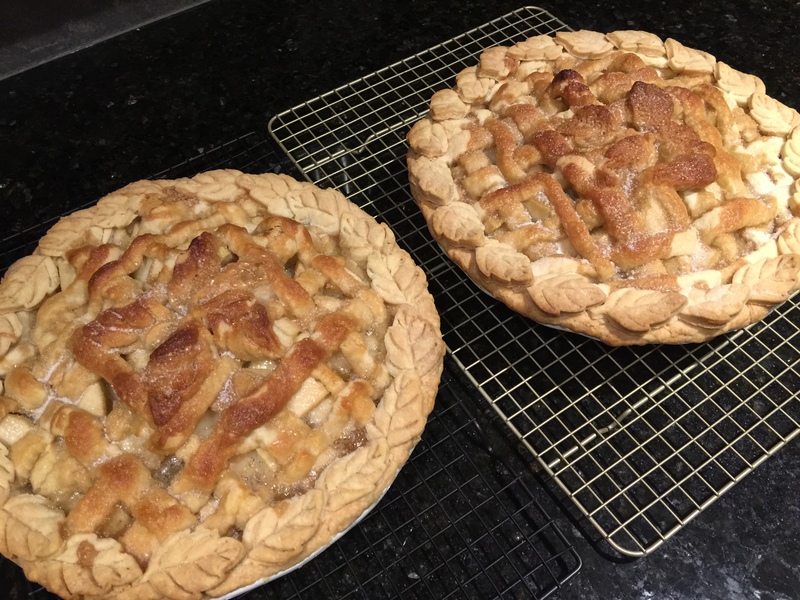 Between the two pies, you’re looking at 6 sticks of butter, 16 granny smith apples, and a lot of other goodness. Combined, it’s at least 10,000 calories but that is because the pieces are huge as I’m hooked on the Emile Henry nougat pie dishes from Williams-Sonoma. Everything else now seems so inadequate in comparison. Go big or go home. 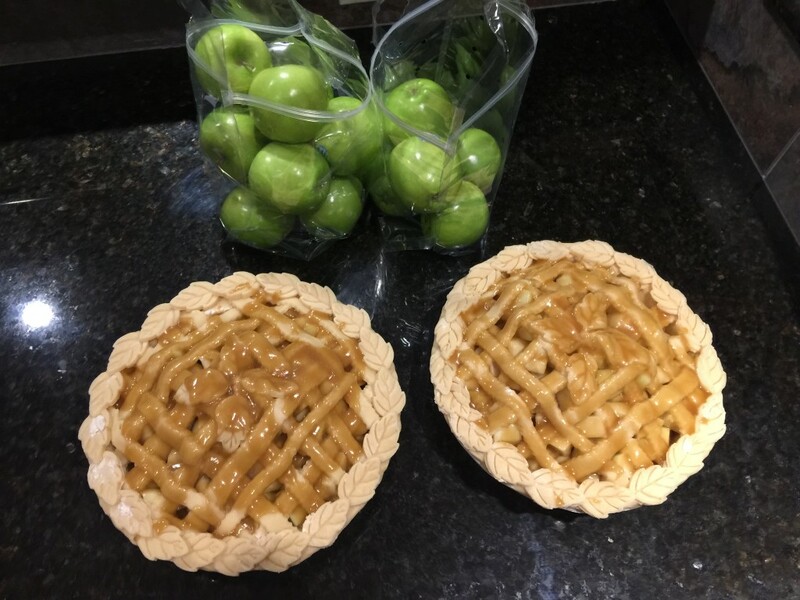 We made the brown sugar caramel sauce to fill the pie itself, which will bubble and bake the apples once in the oven. 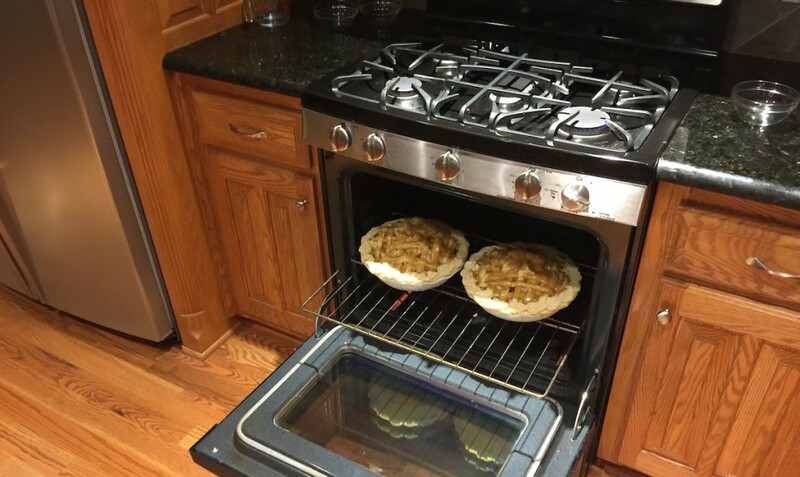 I told you these apple pies were monsters. This gives you a rough idea of the size of them compared to an oven. They have to cool for the next few hours as we sleep. I’m going to bed now. The dozen or dozen-and-a-half articles I’ve been trying to post the past week will have to wait until another night. It’s just that time of year. PreviousPrevious post:You Should Try the Wood-Fired Italian Neapolitan Pizza at Il LazzaroneNextNext post:There Is a Huge Staub Cookware Sale Going On Right Now!